1962: Fadia Ibrahim was born. 1990: Ibrahim immigrated from Beirut, Lebanon to Canada. 2009 : The Virgin Mary first visited Fadia Ibrahim during Mass, by inscribing the letter M on her leg in blood. 2010: In response to now numerous messages from Mary to Ibrahim, a Catholic group in Detroit, Michigan delivered a statue of the Virgin to her. 2010 (March): Ibrahim began to notice the statue weeping tears of oil. 2010 (May/June): Mary told Ibrahim to place the statue outside her home. 2010 (October): The City of Windsor Ontario received the first complaint about the presence of the statue. 2010 (early November): Media in the U.S. reported on the statute, leading to an increase in visitors. 2010 (November 5): After opposition to the display of the statue outside of Ibrahim home, the statue was moved to St. Charbel Maronite Catholic Church. 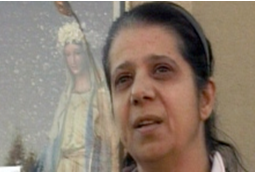 There is little known about Fadia Ibrahim’s life before her experiences with the Virgin Mary. It is known that she was born in 1962 in Lebanon and migrated to Canada around 1990 (Yonke 2010). She resided in East Windsor in Ontario at the time her messages from the Virgin Mary began (Willick 2010). Ibrahim attended the St. Ignatius of Antioch Church, an Orthodox Christian church. Ibrahim’s first encountered with the Virgin Mary occurred during a Catholic Mass. A bloody M appeared on Ibrahim’s leg, placed there, Ibrahim reports, by the Virgin Mary (Wilhem 2010). Mary continued to visit Ibrahim through messages and additional markings on her body. Ibrahim describes Mary in the following way: “She’s pretty. She keeps smiling. She covers her head. … She’s 49, 50 years [old]. … She’s like, I don’t know how to say, she’s different. She’s different” (Yonke 2010). Once word of her messages from Mary began to spread, a family of Chaldean Catholics from Detroit presented a boxed four-foot statue of the Virgin Mary to Ibrahim (Yonke 2010). It is believed that the statue originally came from the Los Angeles area (Morgan 2010). After receiving the statue, Ibrahim stored it inside her home. It was on Canada Day (July 1), she reports, that her daughter discovered that it was dispensing oil. It was a request from Mary that led her to then build an enclosed pedestal on her front lawn to display the statue. Visitors began to appear immediately, and some brought flowers. According to Ibrahim, Mary was pleased. She states that the statue was smiling and secreting oil. Shortly after the statue was placed outside the home, Ibrahim began to report oil secreting from her own hands. Ibrahim stated the oil came from the statue and was of the Virgin Mary (Yonke 2010). Daily attendance at the statue rose to as many as 1,000 visitors per day (Willick 2010). Many visitors to the statue at Ibrahim’s residence believed that the tears from the statue were a sign from God and an indication of the world reaching dark times. Visitors felt that Mary wept out of heartbreak as the world destroyed itself through injustices such as crime and war. Pam Martin, a visitor of the statue, believed the statue indicated such a message: “I watch the news and I can’t help but be saddened by what I see…[Mary’s] weeping for us because we’re killing this world” (Jette 2010). Ironically perhaps, Windsor was known as “sin city” to Americans (Wilhelm 2010). Thus, at least some locals believed that the statue brought much needed attention, prayer, and hope to the area. In this way, the statue was appreciated as a miracle. “I think it’s a miracle from God,” Ms. Ibrahim told The Blade. “She wants people to pray, go back to the church. She like people to believe on her Son, and she want people to help each other as before” (Willick 2010; Yonke 2010). In addition to believing the statue itself is a miracle and a message, visitors believed that the oil from the statue possessed healing powers. 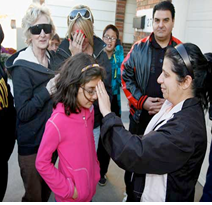 When Ibrahim started to report oil miraculously appearing on her hand, visitors began to seek out her personal blessing. There are reports of visitors receiving healing and answers to the prayers from worshiping the statue and being blessed by Ibrahim (Wilhelm 2010). Large groups of believers, predominantly of the Catholic faith, visited the site to be in communion with the miracle statue of the Virgin Mary. Although in place for a very short time, the statue in Windsor became a pilgrimage site for believers in Marian apparitions. Visitors reported being overcome with emotion upon simply looking at the statue. Worshipers also repeated prayers, such as the Hail Mary, and held religious items such as rosaries and Bibles while worshiping. Even after the statue had been placed in the St. Charbel Maronite Catholic Church, believers attested to the statue’s secreting of tears: “I swear to God, honestly — we’re in church right now — by the fourth decat you could see it, it was just so clear,” Ms. Rizk said. “The tear formed on the top of the eye and dripped down and stopped at the bottom of the eye. It was a statue one second and then it became a miracle, right in front of my eyes” (Yonke 2010). The most important ritual believers engaged in was collecting the Virgin’s oily tears. They believed the oil to be sacred whether through direct contact with the statue itself, with the hand of Ibrahim, or with the hands of those who did touch the statue. Ibrahim only allowed a handful of visitors actually touch the statue. These lucky few would place their hands on the heads of other visitors and bless them. Visitors brought with them ziploc bags, cotton balls, and makeup remover to collect the Virgin’s tears of oil and bring them home (Wilhelm 2010). Sometimes Ibrahim would use her hands to make a cross with the on the forehead of visitors. One woman described the experience as overwhelming: “When she touched me, I just felt overwhelmed and everything seemed to come out,” said Rosanne Paquette. “I felt this warmth, and it was unbelievable.” Another woman testified that her teenage granddaughter was cured of leukemia after Ibrahim anointed her with the oil: “She just put the oil on her, prayed for her…. The doctor said her blood, everything was normal” (Willick 2010). Fadia Ibrahim and her statue of the Virgin Mary encountered opposition from two sources: neighborhood residents and municipal officials and officials of the Roman Catholic Church. Once Ibrahim had moved the statue of Mary from inside her house to the front lawn, the statue quickly came under fire. Neighbors disliked the large increased traffic and noise in the neighborhood, which only increased when the U.S. began to report about it (Caldwell 2010). Neighbors quickly complained to the city and organized a petition against the statue that was delivered to municipal officials. Due to the lack of a building permit and to building code violations, the city gave Ibrahim until November 19 to remove the statue. Ibrahim quickly objected to the city’s notice and collected hundreds of donations and signatures for a petition to save the statue before finally acceding to the city’s demands. Ironically, a city solicitor at the time, George Wilkki, spoke to the media telling them there was an easy solution to the city’s issues with the statue. Ibrahim simply needed to apply for a minor variance and a building permit. Then, the statue could remain at its location in her front yard (Wilhelm 2010). At the same time, Catholic Church officials had begun to investigate the validity of Ibrahim’s statue and its miraculous tears of oil. Church officials dissuaded people from visiting the shrine but never officially denounced the statue. Father John Ayoub of the Diocese of the Windsor Orthodox Church, St. Ignatius of Anitoch Church was more measured in his response (Laycock 2014: 192). He stated that he did not find the statue to be a miracle of God. However, he continued to accept Ibrahim as a member of his parish and allowed others to believe in her message if they so desired. Ibrahim, on the other hand, reportedly felt disappointed by the lack of support from the Catholic and Orthodox churches. On November 5, fourteen days before the city’s deadline for Ibrahim to move the statue, visitors who arrived at Ibrahim’s home found that the statue had been removed. The expressed sadness and curiosity. The only explanation for the removal of the statues was contained in two notes left outside the home. The note on the outside of the statues casing simply asked visitors to leave the family and home alone. The other note, located on the front door of the home read, “The statue has been relocated and this structure will be taken down shortly. Please stay off this private property. Visit your church, please.” Members of the Ibrahim initially denied knowledge of the statue’s location when visitors made further inquiry (Vijay 2010). Ibrahim did subsequently offer an explanation. She stated that she had received a message from Mary asking her to take the statue of the weeping Virgin to the church. Ibrahim insisted that Mary did not want believers coming to Ibrahim’s house to pray, thereby treating it as Mary’s home. Mary, Ibrahim asserted, had only wanted her to attract public attention and then direct believers back to the church. Ibrahim denied any relation between the city’s demand for her to move the statue, or the strain the statue had created on her neighborhood and family, and her decision to give the statue to the church Her final statement was that Mary had given “a message…to pray you have to pray in church” (Vijay 2010). Caldwell, Simon. 2010. “‘Weeping’ Virgin Transferred to Canadian Church.” The Catholic Herald. Accessed from http://www.catholicherald.co.uk/news/2010/11/12/%E2%80%98weeping%E2%80%99-virgin-transferred-to-canadian-church/ on 4 November 2014. CBC News. 2010. “Front-yard Virgin Mary to Come Down.” Accessed from http://www.cbc.ca/news/canada/windsor/front-yard-virgin-mary-to-come-down-1.939349 on 4 November 2014. Jette, Martha. 2010a. “Miracles: Do They Still Happen Today?” (Part 1 of 2). Accessed from http://www.examiner.com/article/miracles-do-they-still-happen-today-part-1-of-2 on 16 November 2014. Jette, Martha. 2010b. “Is Madonna ‘Weeping for the World?’” (Part 2 of 2). Accessed from http://www.examiner.com/article/is-madonna-weeping-for-the-world-part-2-of-2 on 16 November 2014. Kristy, Dylan. 2010. “Visitors Welcome at New Home of ‘Weeping’ Madonna.” The Windsor Star , November 8. Accessed from http://www2.canada.com/windsorstar/news/story.html?id=5c83fa0e-e79b-4671-85a5-6892beb84368 on 24 November 2014. Laycock, Joseph. 2014. The Seer of Bayside: Veronica Lueken and the Struggle to Define Catholicism. New York: Oxford University Press. Laycock, Joseph. 2011. “Controversial Mary Statue Weeps because ‘We’re Killing This World.’” Religion Dispatches. Accessed on Nov 16, 2014 from http://religiondispatches.org/controversial-mary-statue-weeps-because-were-killing-this-world/ . Lewis, Charles. 2010. “Weeping Madonna: Separating miracles from wishful thinking.” National Post , November 5. Accessed from http://life.nationalpost.com/2010/11/05/weeping-madonna-separating-miracles-from-wishful-thinking/ on 4 November 2014. Morgan, Dale. 2010. 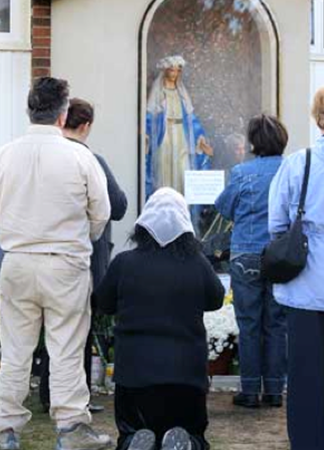 “Canada: Hundreds of Superstitious Virgin Mary Worshipers Flock to Windsor Home to See Virgin Mary Statue.” Accessed from https://groups.google.com/forum/#!search/Fadia$20Ibrahim$20Canada$3A$20Hundreds$20of$20superstitious$20Virgin$20Mary$20Worshipers$20flock$20to$20…/bible-prophecy-news/BEPkyKdPj4E/ywF8T3qvcQcJ on 4 November 2014. Paterson, Andrea. 2010. “A World Without Miracles.” Accessed from http://lifeasahuman.com/2010/mind-spirit/spirituality-and-religion/a-world-without-miracles/ on 4 November 2014. The Canadian Press. 2010. “Homeowners Must Remove Structure Housing Virgin Mary.” Accessed from http://www.ctvnews.ca/homeowners-must-remove-structure-housing-virgin-mary-1.569727 on 4 November 2014. Vijay. 2010. “Windsor’s Mysterious ‘Weeping’ Madonna Has a New Home.” Accessed from http://www.churchnewssite.com/portal/?p=35173 on 4 November 2014. Wilhelm, Trevor. 2010. “Hundreds F lock to Windsor to S ee W eeping Virgin Mary S tatue.” Postmedia News. Accessed from http://www.jesusmariasite.org/Signs/Signs_.asp?editid1=5 on 16 Nov ember 2014 . Willick, Frances. 2010. 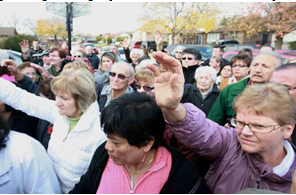 “Crowds Flock to See Mary’s ‘Tears’.” The Windsor Star , November 2. Accessed from http://www2.canada.com/windsorstar/news/story.html?id=0c689192-80db-447f-a128-b6c1f370f8d1 on 23 November 2014. “Windsor Ontario’s W eeping Madonna.” Accessed from http://www.visionsofjesuschrist.com/weeping556.html on 16 November 2014.
http://www.toledoblade.com/local/2010/11/21/Faithful-flock-to-see-statue-of-Mary-reported-to-weep-at-night.html on 21 November 2010.